Tofino in December 2010 brings us the West Coast Winter Music Series, the Winter Celebration Arts and Crafts Festival, and other events in Tofino. ﻿With the winter darkness upon us and the storms pounding from above its that much more important to get involved in all that the community has to offer. Take a course, learn a new skill or simply play. Check the community calendar for all that there is to be involved with. Have a great holiday season everyone and see you in the new year! The West Coast Winter Music Series is back for it’s 11th season. It started Wednesday October 7th with Suzie Le Blanc, the acclaimed Acadian soprano. The series will continue with Soile Stratkauskas on flute and Nathan Whittaker on the cello on Saturday, Dec. 4th, Arthur Rowe renowned pianist will perform Saturday January 29th and the gypsy string ensemble Van Django will grace the stage on Saturday February 26th. Passes for the series can be purchased for $85 or tickets for individual shows can be purchased if space is available. For more information contact Judi at 250.725.3373. All performances are at the Clayoquot Sound Community Theatre. Enjoy some of our area’s finest arts & crafts and meet the people that make them. Over 23 local artisans will be on hand at the Weigh West Harbour Lounge on Saturday, December 11 and Sunday, December 12 to display and sell their work. There will be many quality one-of-kind westcoast gifts for all ages, to meet your Christmas needs. In its 8th year, this little festival has become a popular local Christmas tradition. There will be live music and refreshments. It features a wide variety of locally-made gifts, home decorations, food, and Christmas baking. By supporting local Tofino artists you’re also supporting the arts in our community. 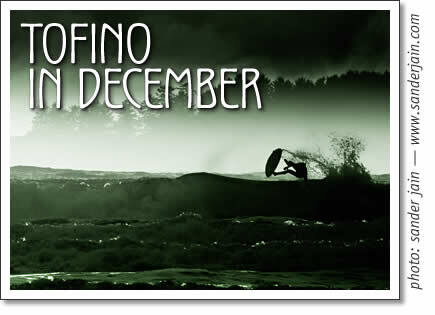 December 2010 is shaping up to be an exciting month in Tofino. An overview of what's going on in town, from Tofino Time Magazine in December 2010. Tofino in December 2010 brings us the West Coast Winter Music Series, the Winter Celebration Arts and Crafts Festival, and other events in Tofino.